Teaching Channel - high quality videos on Math, ELA and much more! I just re-discovered the Teaching Channel, which has about 650 videos on a variety of topics, including 150 on Common Core. Search by subject, grade or topic (including CC but also Planning, Behavior, Engagement, Class Culture, How To's, other professional development...) and get a list of excellent videos with some innovative and effective teaching practices. The videos are usually 2 to 15 minutes long. The Common Core videos I watched (3rd gr. Math and 6-8 gr. ELA) were high quality and could easily be used in 'all' classrooms. There is NOT necessarily a tech component to these lessons, but that could certainly be included, if desired. For each class lesson, the grade, standard and lesson objective are all clearly identified. Once you sign in, there's room for you to take notes in your own space, which was cool. With one click you can save the video you're watching to your 'planner' for later review - also nifty. There's an ongoing blog called Let's Chat Core that is designed to help educators understand and implement Common Core standards. Some great info there, as well. 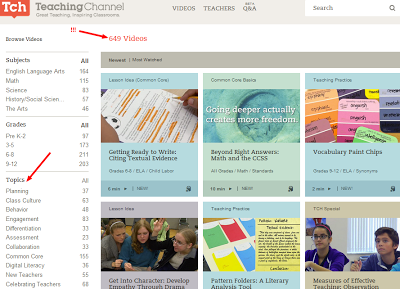 CC Connection: While not necessarily a 'tech' item for your classroom, it's definitely worthy to include here, as the Teaching Channel is a great resource to learn ABOUT CC standards, see in action several specific lessons supporting CC. AND it includes a significant amount of high quality 'professional development' instruction that we can all use, not to mention some great lessons in non-CC curriculum, too. A winner. Haiku Deck has had a lot of visibility lately, so I had to check it out. This iPad app allows the user to create slideshows (called Decks) with a minimal amount of text. We have been proponents of this for a long time in our own classrooms, as it allows students to verbalize what they know, as opposed to reading their slides. They really need to think about what they want to convey, as the images have to tell the story. Haiku Deck offers copyright friendly images and themes, or students can use their own. Decks can be shared via email, Facebook, Twitter, played off the Haiku Deck website, or embedded into your own e-portfolio or blog. I made a little one, and embedded it here. This in no way exhibits the breadth of what Haiku Deck can do, just my limited creative abilities! There are different themes, options for text placement, and sub-text can be added. It is very intuitive; students will find it easy to use. CC Connection: Haiku Deck can be a tool that allows students demonstrate they have met the following ELA CCSS in Reading: Integration of Knowledge and Ideas 7. Integrate and evaluate content presented in diverse media and formats, including visually and quantitatively, as well as in words. 8. Delineate and evaluate the argument and specific claims in a text, including the validity of the reasoning as well as the relevance and sufficiency of the evidence. 9. Analyze how two or more texts address similar themes or topics in order to build knowledge or to compare the approaches the authors take. Speaking and Listening: Presentation of Knowledge and Ideas 4. Present information, findings, and supporting evidence such that listeners can follow the line of reasoning and the organization, development, and style are appropriate to task, purpose, and audience. 5. Make strategic use of digital media and visual displays of data to express information and enhance understanding of presentations. The Futures Channel has some nifty real-world problems, presented via video, with supporting lesson plans, on LOTS of different topics. Its NOT just for STEM - this covers plenty of territory in other subjects, too. A 6 minute Designing Stronger Skateboards video is up top on the home page. I think math students will have fun with this as they learn - a real-world application of math! Here's the lesson that goes with the video. Looks like high-quality info and an engaging approach to me. Please take a look - what lesson did YOU find that worked? Please let us know, folks! CC Connection: A piece of the Common Core mission statement: "... standards are designed to be robust and relevant to the real world, reflecting the knowledge and skills that our young people need for success in college and careers." I think The Futures Channel supports this fully. A significant number of standards - Math, Writing, the 'tech' standards embedded within, AND MORE - are covered in this fun, engaging site. We’d like to take this opportunity to thank all you who have taken an interest in our blog. Your support has been overwhelming, and emphasizes to us the continued need to highlight the use of technology into the classroom. Recent changes in the education landscape put a lot on teachers’ already full plates. 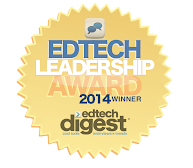 We hope our adventure here can make two parts of it easier – Common Core and Educational Technology. We know there is huge interest in math resources, so we want to re-visit our most popular post – National Science Digital Library – WOW!!!! This site offers a very extensive list of math tools, all linked to the common core, many of which are web-based. If you are looking for a manageable way to pre- or post-assess student learning, or provide additional practice, please check this site out. You can access all our most popular posts on the right sidebar. Please let us know what you like, and more importantly, what you need. We appreciate hearing from you! Teachers are asking for math resources, and here’s a new one, Opus. Opus is a free math problem bank that was introduced at Imagine K12’s Demo Day earlier this month. Teachers can search by grade level and subject area, and Opus will produce a series of problem, with the associated Common Core standard (grades 4 and 6 - 8). They have set up the site so that the most frequently used problems rise to the top of the list. Problems can be exported to a Word or Google document. Have a great problem to contribute? Teachers can upload to Opus too. I think this tool would be great for both pre- and post assessments. CC Connections: Opus is specifically designed to help teachers address the CCSS in math. They appear to be purely computation problems at this point, very useful for practice or for assessment.